Samsung US has begun taking online pre-orders for the newly announced Galaxy Tab S 8.4 and Galaxy Tab S 10.5. You can place your order today and your Tab S will ship in two weeks. 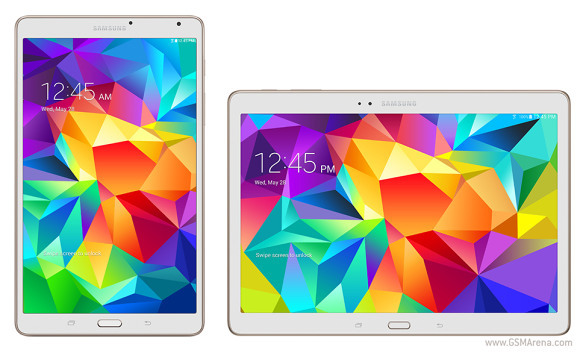 The Galaxy Tab S 8.4 costs $399.99 and is available for order in both white and titanium bronze flavors. You can also throw another $39.99 for the Tab S Simple Cover or $59.99 for the Tab S Book Cover. The 10.5" Galaxy Tab S will set you back $499.99. Its Simple Cover costs $39.99, but the 10.5 Book Cover is priced at $69.99. Both devices are available now on Samsung.com in the USA, while the EU pre-orders will launch soon. The LTE versions will become available later this year, probably in a month or two. All major US carriers will offer them on contracts. Amazon.com is also taking pre-orders for the two slates, they cost the same and will ship on June 26. Wow ! mouth watering sugar coated SUPER AMOLED DISPLAY and dense pixels! And price is not much. Surely this will change the game! As i see, if you order from samsung you got your cover for free! 16GB with micro sd slot is still much better than paying $100 for every storage upgrade 16 to 32, 32 to 64, 64 to 128.